When boating with your family it is important to have plenty of boat shade for the kids. Use lots of sunscreen and keep them covered as much as possible. When my daughters were very young we would keep them covered most of the day with a wet towel. Between the sunscreen, a cute little hat, the wet towel and our Bimini top we never had to experience sunburns. Bimini tops are a must for fun family boating. Below are a couple of options for all of you needing a little more shade in the boat. Stay out of the sun and be prepared for unexpected showers with this handy umbrella. The umbrella can be quickly and easily removed for storage, in it's own carrying case. This two piece umbrella is 68" in diameter to provide ample amount of boat shade for fishing, or to protect the kids, you may have taken fishing with you. The Bass Pro Shop offers a full line of Bimini tops. This one offers 6' of refreshing protection from hot sun and sudden showers. The tops are available in vinyl or long-lasting acrylic. The tops and frames are sold separately and detailed instructions are on the product information page. 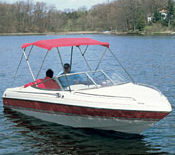 This buggy style Bimini top is designed specifically for pontoon boats. The frame is made of sturdy 1"' square anodized aluminum tubing to match the 1" square rail sizes of today's popular pontoon boat designs. Each pontoon Bimini top comes with nylon fittings, mounting hardware, front tension straps, rear support poles and matching storage boot. Amazon always has a great selection of boat shade following this search.